Federico Finchelstein (The New School for Social Research), author of From Fascism to Populism, in conversation with Ruth Ben-Ghiat (New York University), Mary Roldán (Hunter College), and Ritchie Savage (Pratt Institute). What is fascism and what is populism? What are their connections in history and theory, and how should we address their significant differences? What does it mean when pundits call Donald Trump a fascist, or label as populist politicians who span left and right such as Hugo Chávez, Juan Perón, Rodrigo Duterte, and Marine Le Pen? 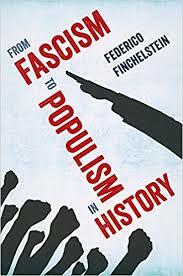 Federico Finchelstein, one of the leading scholars of fascist and populist ideologies, synthesizes their history in order to answer these questions and offer a thoughtful perspective on how we might apply the concepts today. While they belong to the same history and are often conflated, fascism and populism actually represent distinct political and historical trajectories. Drawing on an expansive history of transnational fascism and postwar populist movements, Finchelstein gives us insightful new ways to think about the state of democracy and political culture on a global scale.